Whoa, it's Friday ALREADY! Where is the time going? We don't even have a Christmas tree yet! With the plethora of Pinspirational Christmas manis out there, I realized that there just isn't enough time to try them out individually. So, I've decided to spend the next 10 days combining their awesomeness! Yay!! Each nail got two coats of Paper Mâché to start. Trees: With the small brush, I painted a narrow triangle with Running In Circles. Truth be told, I started with narrow nail tape but the lines weren't clean so I ended up going over them with the brush anyway (stupid Pinterest making it look so easy, haha!). After one coat of Running in Circles, I followed it up with one coat of Harper and then did a dot of Felicity at the top with the medium dotting tool. Santa Hat: After figuring out which way the hat should curve, (which took an embarrassingly long time because it had to be done upside-down) I swooped it on, using the brush that came with Dovima because it was narrow enough. Then, I did a medium dot with Paper Mâché at the tip of the hat and four small dots at the bottom. Penguin: Black Expressionism for the body, with the bottle's brush, then Paper Mâché for the stomach, with the small brush. Medium white dots for the eyes with a small black pupil and Iconic Orange for the beak, applied with the small brush. 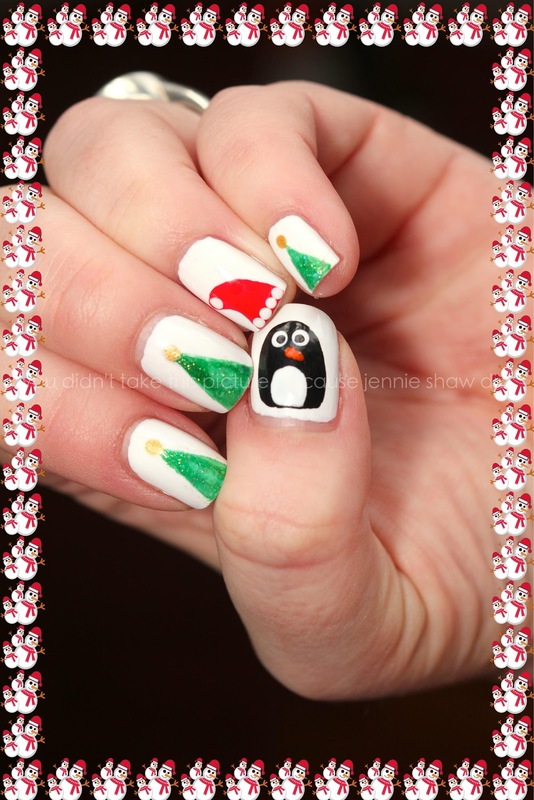 WARNING: I let the penguins dry overnight to prevent smudging but the penguin on my right thumb still smudged! The left one didn't, though, which is not only totally bizarre but also VERY FRUSTRATING as they each took multiple attempts to get done. Seriously, how did one smudge but the other didn't? How was it not dry after EIGHT HOURS? That said, I think the combo of the penguin and santa hat are adorable, and well worth the effort. If I had to rate the three designs in terms of ease, the trees are by far the easiest, followed by the santa hat and the penguins. Adorbable!! Great job on the trees. I struggle with making any type of straight line - and using TAPE - GAHHHH - never works out for me. I'm to impatient! oh my gosh! I feel like I need to step up my game ;) Love your mani! OMG!! I LOVE it all! So cute and festive! I need to get a dotting tool. Super cute Jennie! I've had designs that do that, one hand gets messed up and the other is fine...so weird! Oh, I want Running in Circles! Your Penguin is just so cute. i just died. this is precious! I don't think the trees was the tape, I think it's that Harper. I tried the trees with Harper and they peeled off :/ I've used tape before and it was fine. Love your penguins - for shame that one smudged! Yay! I'm a Human Guinea Pig!